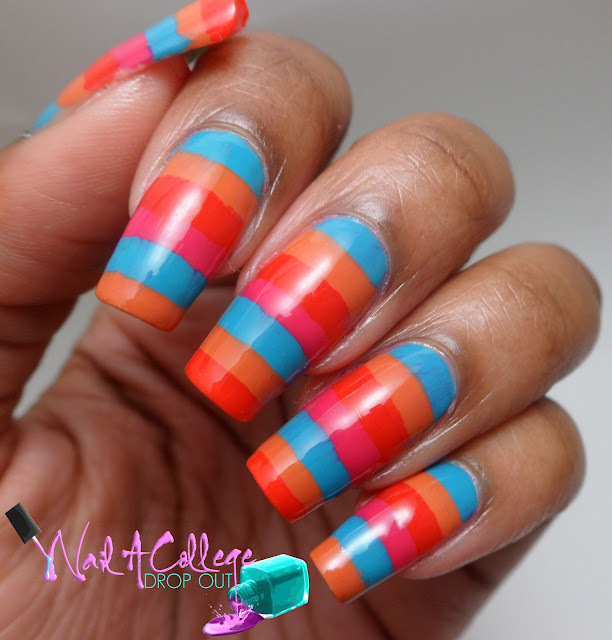 Nail A College Drop Out: Desert Stripes! Press Sample After a week of relative inactivity I finally have the time to sit down, push around some nail paint, and talk blog about it. Forgive me for leaving you all for so long? I've been itching to try some extremely labor intensive nail art, but I figure I should start off with something simple and awesome. Something a long the lines of stripes! I used the LCN Shades of Desert Summer 2013 Collection and really loved the outcome. Being new to the LCN brand I really didn't know what to expect in terms of color opacity and formula, but I was very pleased with both! It didn't hurt that all four of these are cremes. Y'all know how much I love a good creme finish lacquer. All LCN polishes are 3-Free (formulated without DBP, Toluene and Formaldehyde and Cetyl Alcohol). Each lacquer retails for $7.50 and the Shades of Desert Box Set retails for $24.99 on LCNBoutique.com. Looking for the hook-up? use code 5AY3QD at checkout for free shipping until August 15th! So I pretty much wore this mani for a week and loved it. What do you think? If this is simple, I can't wait to see labor intensive! I love it and your nails are so amazing and long. What a great color combo! I've never tried LCN polishes but this collection looks great together. Fab colour combo, looks fabulous on you! Love the color combo and the stripes are great! I'm loving these bright shades! So amazing for summer. these colors look amazing together! These colors work very well together, gee!